Oils are key in creating fragrances. 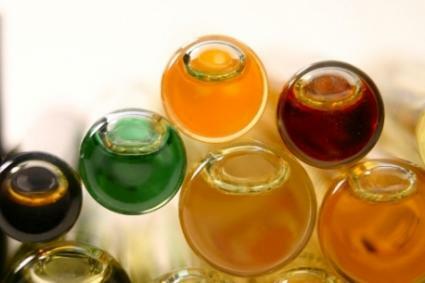 Perfume oils are the essential ingredients of all fragrances. Found in varying concentrations, they create the signature aroma we expect from perfume, fragrances, lotions, bath gels and even aromatherapy. While most are distilled or expressed from flowers or plants, many more are synthetically created in the perfume laboratory. The most important person in the manufacture of perfume is the perfumer, also commonly called the nose. It is the one person, or team of people, that use the perfume oils to create a miracle fragrance. For many perfumes, it is a combination of four to five hundred ingredients to create one single scent. Known in the industry as notes, many of these ingredients are actually rather unpleasant smelling. It is the art of the combination that creates the perfect fragrance. Some of these notes are taken from perfume oils, while many others come from a variety of raw materials. With a bit of chemistry and a toss of composer, the perfumer accomplishes his or her task. With such a vast option of ingredients, you have to include trial and error along with luck in order to create a classic perfume. The fragrance ingredients and perfume oils are added to a carrier, typically denatured ethyl alcohol. The carrier modifies the fragrance's intensity and makes application easier. Depending on the type of fragrance, the concentrations of oils verses alcohol are different. The most common and effective method of obtaining the scent in perfume oils is through extraction. An expensive technique, the plant materials are added to volatile solvents at a low temperature. These solvents gradually absorb the natural fragrances from the plants.Many oils are also created by distillation. The use of steam extracts the essential oils from plants. Varying parts of plants are sunk into water and then brought to a boil. The resulting fragrant steam is captured and cooled. The oils are collected in drops as the steam condenses. These droplets carry a very strong scent and are used in the perfume oils. For citrus fruits, the method of collecting the scent is called expression. The oils are essentially pressed out of the fruit rind. As there are over 4,000 different notes available to the perfumer, for sanity purposes, we will only list some of the most common oils found in today's fragrances. Keep in mind that many of these oils can be purchased by an average consumer as essential oils at most natural health stores. Some may even decide to create their own perfumes at home. Amaryllis - A lily-like plant with umbrella flowers. The oil is commonly combined with rose and neroli in many perfume blends. Bay Leaf Oil - Distilled from the West Indies tree leaves, this oil is common in masculine fragrances. The aroma delivers a warm, spicy, and somewhat bitter note. Bergamot - A tangy oil that is expressed from the nearly ripe, but inedible bergamot orange. The citrus scent is important to many fine perfumes and colognes. Cedarwood Oil - Distilled from the North American cedar, it offers a woodsy undertone. This oil provides a good base note for many men's colognes. Citronella - Derived from a Sri Lanka grass, this oil offers a pleasantly warm, woody, and surprisingly sweet odor - used to impart an aroma of dewy leaves to many fragrances. Clove - A common oil and herb, it imparts a sweet and spicy note to a fragrance. Galbanum - A gum resin that contains aromatic oil, used to create the green note. Gardenia - A very rich and heavy odor, this oil is a precious ingredient. Although too strong to be used alone, it can be softened by more delicate notes. Geranium - The oil is derived from the leaves and steams, it is one of the most widespread perfume oils produced. Ginger - A warm and spicy oil, it adds the flair to oriental and modern fragrances. Hyacinth - The strong scent of this flower is only released just as the flower first appears on the plant. The odor of the oil is a powerfully sweet scent. Jasmine - One of the most significant of all the perfume oils, jasmine is extremely potent and imparts a smoothness plus energy to a fragrance. Lavender - An oil common in perfumes and aromatherapy. Lemon Oil - Expressed from the rinds of a special variety of lemon tree, this oil employs the top note in countless perfume types. Patchouli - Derived from a leaf, this oil offers a musty exotic scent and is common in oriental fragrances. Rose - One of the finest of the perfume oils, it takes approximately 4,000 rose petals to extract one pound of fragrant oil. Sage - Distilled from the flowering herb sage, it is an aromatic member of the mint family. The oil tends to reduce some other harsh notes, by balancing with a mellow and sweet scent.